R2-D2 in brief: A traditional platform collect-em-up, where the diminutive Star Wars droid takes an unlicensed holiday in a Manic Miner-style world; avoiding baddies whilst collecting nuts. The reason for this isn’t desperately clear, but I'm assuming he is going to use them to build something from Meccano whilst C3PO looks on and chides him. Interestingly, game author 'kas29' (a.k.a. 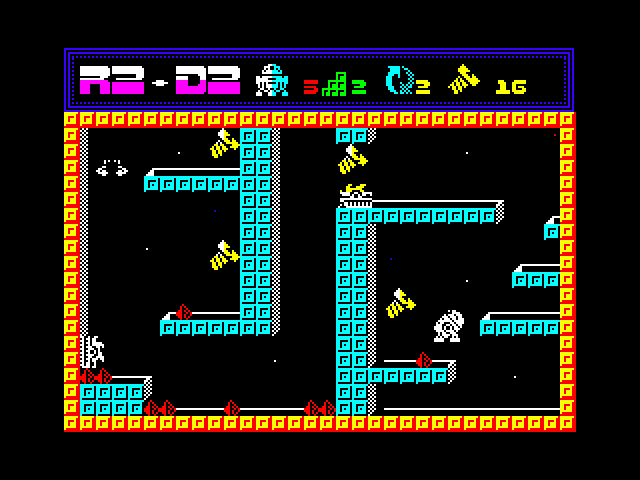 Алексей Кашкаров) has used Jonathan Cauldwell's Arcade Game Designer to make R2-D2, and although a polished effort with nice sprite design, the end result is somewhat 'by the numbers'. Had this been a 1983 Mastertronic release it would have been considered reasonably good, but Speccy owners have somewhat spoiled for choice since then, and unfortunately this fails to stand out amongst a crowd of similar titles. Each level of R2-D2 must be attempted numerous times, with an increasingly difficult layout of nuts/baddies which prolongs the length of the game but also speeds up how quickly boredom sets in (and the repetitive in-game music doesn't help). The platforming is unforgiving, as is typical of this style of game, and frustration is somewhat inevitable upon repeated deaths and restarts. On the plus side the learning curve is tiny (O, P and space are the only keys needed). 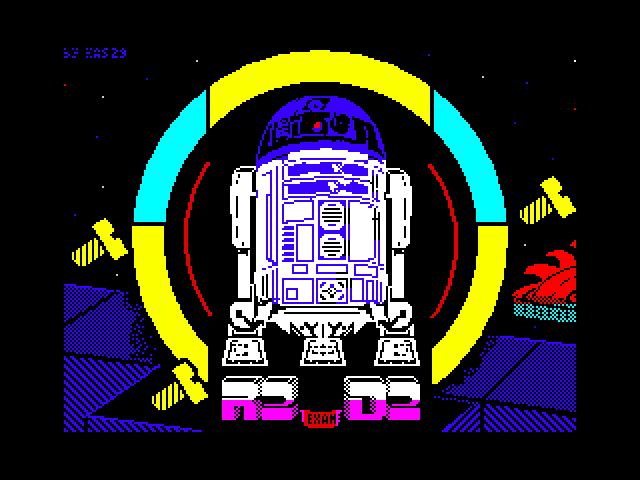 Also in R2-D2's favour are the a rather attractive loading screen, and the really excellent music on the title screen, but ultimately there are better (and more varied) genre examples out there, so this is only for those who are drawn to the idea of seeing what A.G.D. can do, or are suckers for the seemingly tacked-on Star Wars theme. Download the game here (direct link).